I finally finished these guys the other day. They are pulling double duty being fitted with regular packs and jump packs as well by the way of magnets. 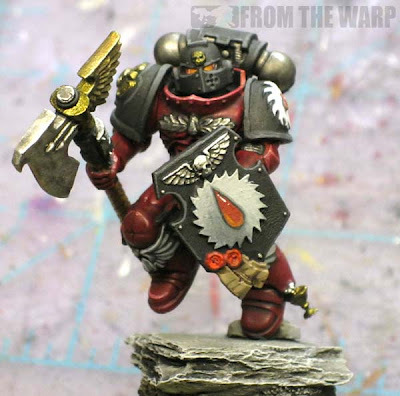 They were huge departure for me in terms of how I highlight models (following the GW scheme) and painting a darker red since most of the time I paint a much brighter and purer red for Blood Angels. I have to be honest, I really like how these guys came out and they are in my top five color scheme for sure. Here are a couple of the squad members. 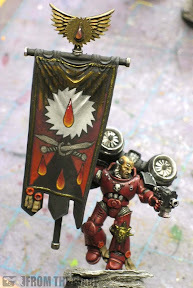 I'm going to include a picture of the banner bearer as well since I'm still putting the "how to" together for it. I think this guy really makes the squad stand out. Of course I'm partial to banners so it may just be me. This one was a real challenge for me since I was working on the plastic Space Marine banner and not starting from scratch and using cardstock as I prefer to do. The image was provided and it was my job to simply get it on there. I think I did a pretty good job in the end seeing as how I don't do it this way very often and I wanted to make sure the quality of the banner held up to the quality of the squad overall. I won't lie, I learned a good number of lessons painting this thing. I'll have all of them together in another post on the banner alone in the coming days. See the completed Librarian here. Looking good! The banners and symbols in general are very well done! May I be so bold as to suggest a slight wash of colour on the light of the Apothecary... Nothing drastic - maybe just a dab of yellow to give a hint of tone? I agree the colour scheme is fantastic. 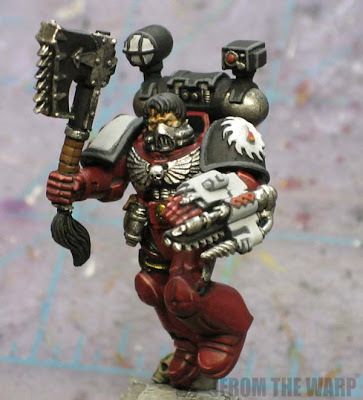 Great job - its inspired me to make my next army Flesh Tearers. Looking back at your guide, its great to see how these have all come together. Love that red. Much nicer to my eyes than the "Poke you in the eye" red that you usually see on Blood Angels. looks great as always ron, out of curiosity what packs are those? Ron, nice work as always. Although most don't notice while looking at that excellent paint job - you did a flawless job with the poses of the minis! Thoes running legs work with either of the backpacks and the bases are perfectly done to compliment it. Swaping backpacks with magnets is pretty easy to do, but making the mini's look great with two totally different backpacks is very hard to do - great moddeling! Thanks gus, I appreciate the words. oink: A good idea in hindsight. I opted to leave the color off the light so as to not draw attention to it, but failed to think of a wash that might add just a tint of color. That may have been the trick to use. Hudson: I deliberately tried to make it more of an orange for a bit of contrast since I only had one guy in a helmet. 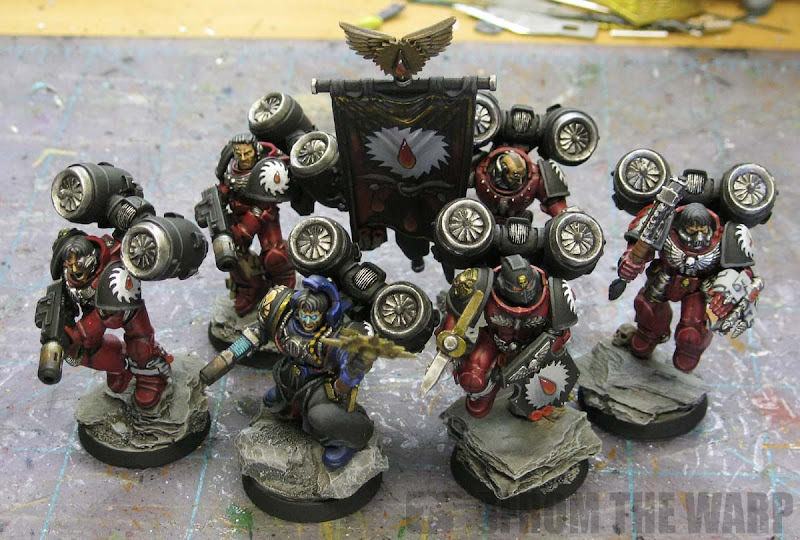 Anon: The jump packs are from Chapterhouse Studios. They clean up fairly easy although you need to be careful with the center of the fan blade, it can break off. I like the look they give Space Marines over the traditional jump packs myself. Nice job- I think they're great! How did you do the black? 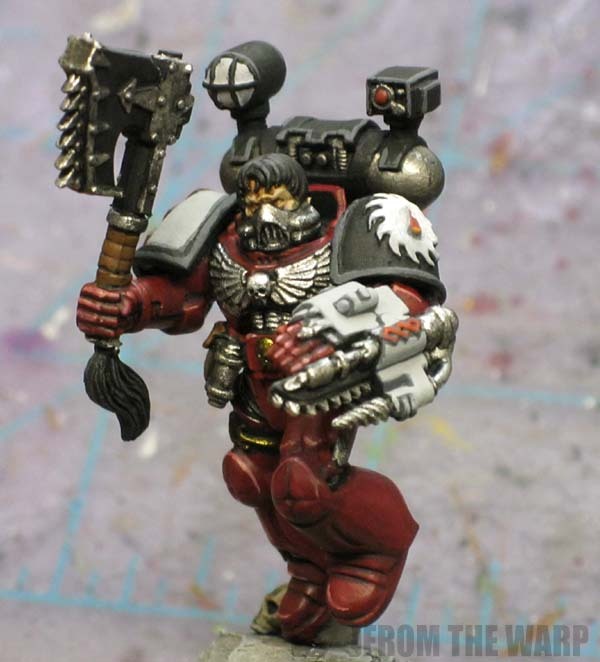 I'm looking for a very muted style like yours (to give the models an older / worn look). I experimented with basing them grey and then washing them to black, but that takes a long time and a lot of wash. I'm going to try starting black and highlighting up and then washing it down a bit- hopefully that will work better. love them! looks more like the official scheme compared to mine, but fantastic job! Tallarn: Truth be told, I didn't build these guys, they came to me this way. The only small part I had in it was adjusting how they were attached to their bases. Reid: They are spray painted black and then for these guys it's just a simple dark grey line highlight. Sometimes I'll use a zenithal type approach and do some blending of a dark grey into the black. I too have seen the dark grey that is washed with black but I just can't seem to get it right in the end. Sometimes I'll use a black wash to tone down my dark grey highlights if I really want them to be subtle. The Amethyst Studios: Thanks. It was interesting to try doing it the "official" way. You've outdone yourself. These guys look great and seeing them come together has been brilliant. I've got two BA armies on the go at the moment and I have been dreading painting them. Your tutorials have been superb. GDMNW: Nope, but now you know why I spent the extra time building the symbol for the front of it. It came up during priming and I was not able to get rid of it. Besides, I think the sculpted icon looks better there anyway. Gives the model some added texture and it doesn't look so plain. 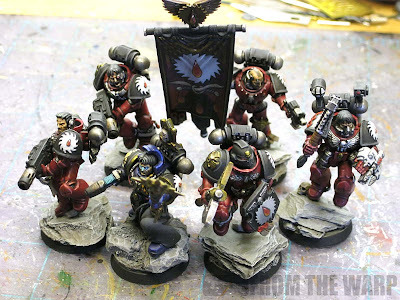 Good luck with your Blood Angels, I had fun painting these guys because I enjoy painting red and this was a shade of red I've never really tried before either.